Item #E16828 - Chunky Bright Red Plastic Dangle Drop Earrings. Flaw: A small chip on the back of a block. Do you remember the Twiggy days in the 60's? This pair is from that era when huge, chunky, Dangle Drop Earrings was the fad. But I think this stunning pair is timeless. They look great anytime on anyone who has the bold personality to wear them. 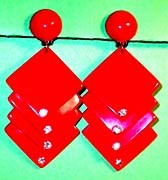 They are bright red dangling boldly 4" in length. Each piece has four links of square blocks. Each block measures 1 3/4" x 1 3/4" and a glitzy rhinestone to draw even more attention. They link loosely and when moved slightly, the blocks clicking each other producing crisp, clattering musical notes. This is a bold, fun and noisy pair! They look especially good if you have short hair or wearing your hair up. Click backs. Excellent Condition. US$78.00. 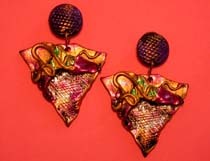 Item #E16838 - Artist's Palette Purple Multi-Color Dangle Drop Earrings. Size: 3 1/8" long and 2 1/4" at widest point. This pair of earrings are indeed interesting and unusual. They remind me of an artist's palette. I cannot be sure if they are wood or plastics. They have wonderful colors. The painting is so unconform that it could be hand painted. They are so gorgeous and unique, you'll love them even if you are not artistically inclined. Clip backs. Excellent condition. US$38.00. SOLD. Item #E16834 - Green, Amber, Citrine Rhinestone And Antique Goldtone Dangle Drop Earrings. This is a hefty pair of earrings. The pendant is a thick dome (1 1/2" in diameter) embossed in scrolls much like the ancient Roman spiral designs. The ear clip and the dome are further decorated by amber, green and citrine color stones. Hanging from the dome are five small open-end round balls to complete this fabulous creation. Click backs. Excellent condition. US$68.00. Item #E168276 - Apple Green Peridot Aurora Borealis Crystal Rhinestone Goldtone Vintage Dangle Drop Screwback Earrings. Size: Length: 1 5/8". Width: 5/8" at the widest point. I love the beautiful apple green peridot color of the sparkling crystal rhinestones! The top round cut stone and the bottom emerald cut stone are Aurora Borealis coated to give you that additional gorgeous rainbow shine. All the exquisite stones are individually prong set into goldtone metal. Very feminine and seductive. Screw backs. Excellent condition. Fabulous earrings for weddings, proms, parties and special functions! US$48.00. SOLD. Item #E16815 - Genuine Austrian Amber Crystal Vintage Dangle Drop Earrings. Four gorgeous faceted round amber Austrian crystals dangling alluringly on a gold tone chain, graduating in size with the largest crystal measuring a generous 1/2" in diameter. This pair of sparkling dangles not only looks fabulous, it is great to the touch and has a feel of weight and substance to it. Clip backs. Excellent condition. US$68.00. SOLD. Item #E168275 - Alice Caviness Art Glass Beaded Vintage Button Clip Earrings. Size: 1 1/4" x 1 1/4". Designer: Signed ALICE CAVINESS. Alice Caviness jewelry is highly collectible and much sought after. The reflective round faceted glass beads have glitzy golden glass seed beads accenting the top. The glossy irregular art glass beads are in beautiful shades of amber and blue. All these glorious glass beads are fashioned into a gorgeous foral or star design and then wired securely onto two layers of antique filigree goldtone base. They are then further embellished by five shimmering edged goldtone swirls accenting the beads to add depth, beauty and curviness. Clip backs. Excellent Condition. Fabulous earrings for weddings, proms, parties and special functions! US$128.00. 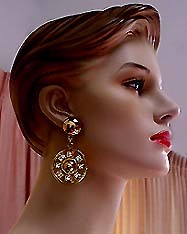 Item #E168274 - Geometric Clear Princess Cut Crystal Goldtone Spinning Wheel Vintage Dangle Drop Clip Earrings. 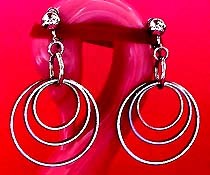 If you love big, bold jewelry that are geometrical and round, these beautiful dangle drop earrings are speaking to you! The mirror finish top ear piece is domed, smooth and shiny. It matches beautifully with the smaller domed round shiny button below. The gorgeous princess square cut sparkling clear crystals are sure setting the wheel in motion. They draw distinct contrast to the bold roundness design and add jazz and glamour. Wear them, swing them and feel free to have an attitude! Clip backs. Excellent condition. Fabulous earrings for weddings, proms, parties and special functions! US$88.00. Item #E168293 - Clear Crystal Silvertone Long Vintage Dangle Screw back Earrings. Size: 3 1/2" x 3/8". These flashy shoulder dusters are long and drippy. The top is an arch encrusted with shimmering clear round crystals. 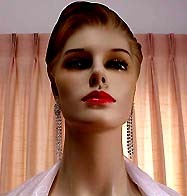 Then three clear rhinestoned strands cascading with the middle strand slightly longer to eccentuate the dripping effect. All the beautiful stones are prong set in bright silvertone metal. Tons of sparkles just from a little toss! Screw backs. New old stock in mint condition. Fabulous earrings for weddings, proms, parties and special functions! US$78.00. SOLD. Item #E168277 - Marvella White Faux Pearl Clear Pave Crystal Rhinestone Silvertone Vintage Button Clip Earrings. Size: Almost 1" x 1". The gorgeous luxuriant center white faux pearl (3/8" in diameter) has ultra high luster and a beautiful natural pearl shine! The surrounding clear pave crystals are all bright and they dazzle like diamonds. It looks like a lustrous pearl sitting in the center of a sparkling donut! Very well made, totally believable, upscale and classy! Clip backs. Excellent Condition. Fabulous earrings for weddings, proms, parties and special functions! US$88.00. SOLD. Item #E168295 - Clear Crystal Drop Vintage Dangle Screw Back Earrings. Size: Length: 2 1/2". 1" at the widest point. 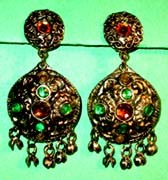 These beautiful earrings are new old stocks, meaning they are vintage but have never been worn. They are glistening with small prong set clear round crystals done in a loopy design and have a square of four glitzy clear prong set round crystals atop. Very soft and flexi, dangle beautifully and glitter like white diamonds. Screw backs. Mint condition. Fabulous earrings for weddings, proms, parties and special functions! US$68.00. SOLD. Item #E168104 - Art Deco Style Emerald Green Crystal Rhinestone Gold Tone Vintage Dangle Screw Clip Earrings. Size: Length: 2 5/6". Width: 3/4" at the widest point. What a beauty! 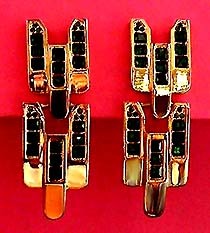 These fantastic Art Deco style elegant earrings feature gorgeous glitzy princess cut Emerald green crystal rhinestones. The contrast of rich green and bright gold, coupled with the neat geometrical design make these strikingly beautiful earrings truly a sight to behold! These lovely earrings are clip with screw backs which enable you to adjust for comfort. Excellent condition. Fabulous earrings for weddings, proms, parties and special functions! US$138.00. 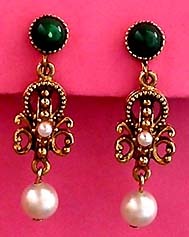 Item #E168128 - Florenza Faux Pearl Fleurdelis Goldtone Vintage Dangle Drop Earrings. Flaw: A small white spot on the green glass cabachon. Size: Length: 1 5/8". Width: 1/2". How dainty and feminine! The ear piece is a rich green glass cabachon taking on the appearance of jade. Hanging from it is a Fleurdelis design of which center is an arch of raised goldtone beads accented by a small faux pearl and a larger lustrous faux pearl hanging at the bottom completes this beautiful antique Florenza earrings. There is a small white spot on the green glass cabachon as seen in the photo. It is not noticeable and looks more like a reflection. I mention it just to be thorough. Clip backs. Excellent Condition. US$98.00. Item #E168268 - Fushia Diamond Cut Crystal Drop Vintage Dangle Screw Back Earrings. These gorgeous earrings are so simple yet so classy and beautiful. The exquisite crystal drops (1 1/4" x 3/4") are of a lovely fushia color and emit flashes of pink and purple twinkles. These superb crystal drops are beautifully faceted, cut into an elongated diamond shape and have tremendous depth in clarity. They sway femininely and draw attention to the face! There is also a glistening fushia faceted round cut crystal above the shimmering crystal drops. Very pretty indeed. Screw backs. Excellent condition. Fabulous earrings for weddings, proms, parties and special functions! US$118.00. SOLD. Item #E168259 - Clear Crystal Rhinestone Silvertone Vintage Clip Earrings. These beautiful ear huggers are showy, dimensional and sparkling! They feature exquisite sumptuous marquise cut dazzling clear crystal rhinestones and round cut clear crystal rhinestones, all carefully and individually prong set into bright silvertone metal. The design is very feminine and hugging the ears with lots of elegance and grace. And note the side profile (please see the large photos) of the layering design making these earrings already beautiful earrings even more ravishing. Clip backs. Excellent condition. Fabulous earrings for weddings, proms, parties and special functions! US$98.00. SOLD. Item #E168262 - Smoky Glass Bead Vintage Floral Button Clip Earrings. The center is a cluster of smaller faceted smoky glass beads surrounded by eight larger faceted smoky glass beads. The surrounding glass beads are tilting upwards to form a gorgeous flower design. The beautiful smoky beads have much clarity and emit a lot of shimmering flashes! A quiet, subtle beauty. Clip backs. Excellent condition. Fabulous earrings for weddings, proms, parties and special functions! US$78.00. SOLD. 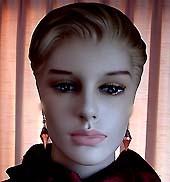 Item #E168158 - Artistic Three Circle Silvertone Vintage Estate Antique Screw Clip Dangle Earrings. Size: Length: 2 3/4". Width: 1 6/8" at the widest point. These ravishing Dangle Drop Earrings have a gorgeous artistic geometrical design. The dangle features three shiny chrome-like circles which sway enticingly at the slightest toss of the head and make delightful soft clinging sounds. Very alluring and flirtatious. The largest circle is 1 6/8" in diameter. They look fantastic with any attire or in any occasion. 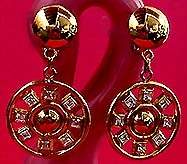 These lovely earrings are clip with screw backs which enable you to adjust for comfort. Excellent condition. Fabulous earrings for weddings, proms, parties and special functions! US$128.00. SOLD.